Here is the portrait of an extraordinary - yet in many ways typical - English couple, as seen through the eyes of a fascinated, ouzo-guzzling Greek narrator, reminiscing on a sun-drenched beach. Under his passionate, yet humorous, scrutiny, Mrs. Freeman and her husband come alive with great vividness, while retaining intact the mystery of their "otherness". 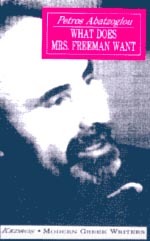 The book is much more than the story of Mrs. Freeman's life and times.